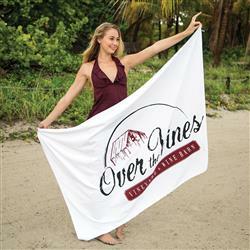 When you really need to impress, our luxurious 24lb./doz., 40” x 70”, terry twill hemmed beach towel will fit the bill. Relax on the large size towel at the beach, the pool, or the home. Price includes one color imprint or add embroidery for very small additional cost. A great heavyweight custom beach towel! Price includes a 1-color custom imprint. Comes in white. Typical Imprint Area(s): 25" x 50". Available Imprint Options: Screen or embroidery. Includes 1-color imprint. 40” x 70”, 24lb./doz., terry velour, 100% cotton towel. Twill hemmed heavyweight beach towel. Price includes a 1-color imprint.